Trent Harrigan, 26, of Slaney Hill was charged this morning, June 8, 2015 with attempted murder on a man, who Virgin Islands News Online can confirm is Kani Hazell. “The man wounded in the incident is at Peebles Hospital in critical condition. 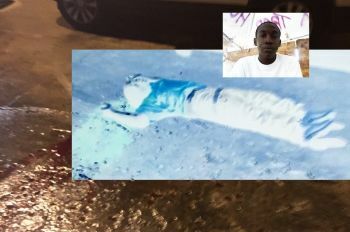 Officers are asking for more members of the victim’s family to come forward so that they can be informed on his condition,” a press release from the Royal Virgin Islands Police Force stated. Meanwhile, a close friend of Hazell said he is recovering, having undergone surgery at the Peebles Hospital. The friend also disclosed that Hazell was shot to the head and had undergone surgery on Sunday. "My friend is a lucky man. I don't know who did that but like they got beef with my boy," he added. "But he was talking which means he is going be good. He is not critical like some people chatting," the close friend of Hazell disclosed to this news site. Information reaching Virgin Islands News Online is that a man was shot outside of UP's Cineplex early this morning, June 7, 2015. It is not clear exactly what part of the body or how many times the man may have been shot but, according to reports, the victim was bleeding badly. He was subsequently rushed to Peebles Hospital. "Yes, I can confirm that one person was taken to Peebles Hospital following a shooting incident outside UP's Complex early this morning," Police Information Officer, Diane Drayton told Virgin Islands News Online moments ago. This news site will bring you more details as they come in. Where the hell is the gun control legislation that NDP promised us. How long does it take to pass a law. It did not take long for them to legislate away our freedom of speech and the freedom of the press. But they did NOTHING to to help the crime situation Three and a half years and crime is Neglected!! Three and a half years and the crime rate is UP. Now they want our vote again. Strupps!!! Dr Smith has FAILED. The law has already been passed idiot. Try paying attention to issues in your country and you wont make yourself look lije an @$$ asking foolishness. And regsrds to timing it takes a long time to pass legislation because once enacted it affects us all for a long time to come. We need to embrace knowledge and not ignorance. Was waiting for your response your fool. The BILL was passed just before your party dissolved the house. This has done NOTHING for crime in the past three and a half years. That was just another after thought and a BAND-AID to make it appear that NDP is doing something. A BAND-Aid like all the work that is happening now and will STOP as soon as Monday passes. Crime Rate has risen under NDP. This is something that they have been trying to keep quiet. They were too busy looking after themselves, to have time to look out for the people who put them in there. Dr Smith has FAILED. Dude, whether it was passed or not, what that have to do with someone shooting someone? NDP look like robocop? Can you, kind sir, detect crime. Man, are you ignorant. Didn't know depending on what government was in, people wouldn't shoot others. Or buy guns illegally. Lol, grow up. Election time gets to everyone's heads these days. You got to be a stone cold idiot. All y'all who blaming these parties for crime need a lick over Ayo heads. Foolishness. Bull$%^&. Nonsense. I have to question whether you have a brain or not because its beyond ridiculous to blame NDP for this. Really you right. Regardless of the legislation ignorant people is who kill people not the Government nor gun. The NDP government has endorsed it by testifying for the accused culprits in court. A government that is strongly against such actions would not beg the courts for mercy for these offenders. If they do the crime, let them do the time. and the government still in! stop this foolishness buh under NDP government ! Good lord. Prayers and well wishes go out to the young man and his family. When will the idiocy end? This is just sad....why my people why...young lives going down the drain.. It will continue for as long as the barely skilled and educated black boys and girls stop breeding and bringing children into this world that them cant afford nor want. These fxxxxing people---fxxxxxing up the place----I am tired of it------Gun shooting Crime, send them England to serve their 25 years.----same way America got federal crime we need the same for gun shooting. Why send them to England where they can learn how to become real [cough] G's, and why burden the people living in England with the cost to send them to criminal school...? Its Tortola's problem, let RVIP deal with it if they can. I hope who ever gets elected realizes the real problems going on here. And does something about all these illegal guns !! Right after the jam session so don't blame NDP people. Mehson this must be a serious sign. can anyone honestly say **********************is a good rep for the youths and town boys around the block? This is our town centre we don't need shady people running it. Vote out corruption. Open your eyes people of the Virgin Islands do not let our country down get our young people away from *******. God bless these Virgin Islands that the right decision is made. Wake up people wake up the sign is there. Come on people stop the nonsense of blaming parties for the crime people in this country doing.This is real no game playing we need for our young men to stop the violence. Once their are lack of respect for our people and culture there will be crime. It start with our leaders it start in the house of assembly. We are a people of principle pride respect. BVI politics being demoralized. The worst is yet to come if we the people don't stand up for the principles our forefathers build this country on. Vote to restore our BVI. Take a stand this election. Are you the one to set an example? it starts in the home. Parents need to train, teach, and be role models for ther children. It is not the politician's job to nuture your children. It is your job! Stop the blame game!~ Train up your children in the right way. That means you must be right. You must know right! You must do right. Take up your responsibility for your children and stop blaming otherS! STOP IT RIGHT NOW OR YOU WILL NEVER SEE ANY CHANGES. ALL THE GOVERNMENT CAN DO IS DLOCK THEM UP WHEN THEY BREAK THE LAW. i AM TIRED OF THIS IGNORANCE. U got to b a police, my comment burn u f.... Pig, dem dont drop charges, but them go after who dem want huh!!! N provide the evidence for who them, think we stupid out here fool!!! To lol it is people like you that contributes to some of these negative behaviours...god help you if you have kids. Bet you speak that way to and around them. I wonder..are you the parent who go to a certain school who I heard complaining to an official that his parents curse him regularly? Well sorry for all who give you a thumbs up for the comment. It is quite unfortunate that you're still uninformed about the justice system in the BVI. For all those who support this assertion let it be known that the DPP office prosecute matters at the courts. The files are handed over to them for their expertise, they argue each case before magistrates, judges and jurors accordingly. If you're gonna blame an agency ensure it is at the correct one. Since when police drop charges? Let's go. What is causing crime is young people (some) don't have minds of their own. They want live up to street credibility and follow what they see in Hollywood. Children rearing children, fathers neglecting their kids, mothers leaving kids home to go party or do them self. When you remove these core essentials like church and society looking out for each other this is the outcome. A poor mother got to hold she belly this morning for her youth. This is not just the police problem this is our problem as a country. It is we who are on the international arena, it's us they point the finger at. It's time we cd together de man to fix this problem . Laws only deal with 10% of the issue; the remainder can only be dealt with if we as a community take a stance. When are we all going to stand up against this kind of evil ? How can the community take a stand when our leaders are creating a culture of disrespect and ignorance and we accepting it? It's ok for our leaders to be telling people get the f*** out my face, it's ok to be cussing and carrying on. It takes a good leader to build a strong community!! You probably one of the few person willing to take a stand. Anger management need to be taught in our high School---these young people get angry for every little thing.. And talk about violence-- Why?--We have to show them a better way to deal with disagreement. Then say the beef started from VIP jam! Instead them do something productive wa dem a do! Rebelious music and alcohol! It contributed to de outcome! What alchohol? Who was selling alcohol Yo Mama Van? I was at a certain medical complex recently when two well dressed young men walked in. Their dress and hair style were emasculated. Their shoe and jewels were expensive. Had it not been for a prisoner officer with them,one would have thought that they were celebrities with a bodyguard and not prisoners. I do believe that anyone regardless should be given humane treatment but when our prison is like a hotel and criminals are celebrated,there is nothing to cause our young men to think before they act. As parents,citizens and residents,we all have a part to play if this territory is to remain a safe place. It should not be left to teachers,politicians or the police to make this happen. To Really? I have been there. It not really a 4 star..more like a three but its ran like one. Why everyone blaming government or the police?? The ONLY ones to blame for crime in the BVI is YOURSELVES!!!! It is how the child is raised (or isn't) that is responsible for this crap. It use to be "It takes a village to raise a child", now it's "The whole village is idiots". You reap what you sow. SMH at RVIPF...How in teh world did you get to charge Trent Harrigan he wasn't even there! I don't know the trigger man but I know Trent and he wasn't there. What happen to the CCTV cameras? Come on man you (RVIPF) provoking the public by locking up the wrong people all the time! So tired of hearing about politics, even with things not relating to. If y'all have information about the shooting y'all should call the Police and tell them. If y'all want to see crime solve y'all should start coming forward instead of forever blasting the Police. The Police can only do as much as their resources allow them to. Think of it this way... You help the Police with the investigation, you help the community, in effect, you help the victims of crime. so why not help out instead of blasting.... seen! Ignorance is a boss, lets stop balming the polictician them, and blame them harden @$$ rude @$$ children them you all have out there. If I decided to take a gun and shoot anybody (God forbid) you trying to tell me its NDP fauult. Really stop the hatered and ignorance in this place. People of the BVI wise up, put a grip on our your children from now because one day they will lead this same country and what you think is going to happen???? Hear this I will pack sack and heltr scelter from Tola, not to even look back, that how serious it will be. THE GUN LAW WAS MADE FOR NON-BVI LANDERS. BUT THAT'S A GOOD THING, WHEN YOU THINK YOU'RE HURTING OUTSIDERS. YOU'RE HURTING YOUR OWN. I AM LOVING THIS!!!!!!!!! Go locals!!!!!!!! Kill each other. It's you guys getting out on bail for crimes committed, the laws are not for persons from here!!!!!! At least that what the magistrate thinks. what is the head of task force doing? cocking his jac%@$$ self and doing nothing.